Eye Vet offers a comprehensive referral service in the medical and surgical treatment of a wide range of ophthalmic disorders. We offer your animal a specialised service in order to provide the best outcome possible when eye problems occur. The goal is to resolve the ophthalmic problem or control it in the best possible way until treatment may be continued at your regular veterinary practice, which referred you. BVA/KC/ISDS Eye Testing for breeding dogs is also available. Natasha Mitchell has been dedicating her time to ophthalmology since 2002 and now works exclusively treating animals eyes. Based at Crescent Veterinary Clinic, she works with the team in this well-equipped purpose-built modern practice to provide a complete medical and surgical ophthalmology service. She travels to Cork and Galway once a month seeing eye cases. 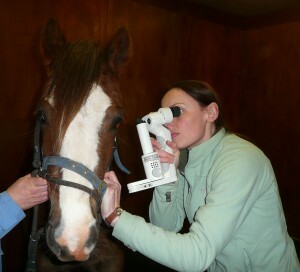 She is also an experienced equine ophthalmologist, and sees many horses with eye problems from around the country. 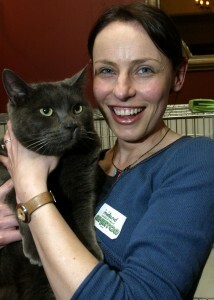 Natasha works to a very high standard, and holds the RCVS Diploma in Veterinary Ophthalmology. A diploma is the highest qualification which can be obtained. She is also a Veterinary Council of Ireland Recognised Specialist in Veterinary Ophthalmology.